I’ve always been an early adopter of technology. When personal computers first came out, my parents made sure we had one. Sure, it was an Apple II+ and it TYPED IN ALL CAPS ALL THE TIME, but it put us on the cutting edge. It also put me on track to disassemble and modify devices after the Apple IIe came out (with its functional shift key) and I figured out you could run a jumper wire to make the II+ stop YELLING. My brother procured a used modem from his football coach and there we were, dialing up all kinds of trouble. I learned the virtues of the “pretzel” key with a Macintosh Classic, then finally joined the world of color monitors with Windows Millennium Edition. After surviving a medical school that made us use Lotus Notes, I headed off to residency at a hospital with a half-baked Cerner system and finally found myself in practice with Medical Manager. I felt like I was really on the cutting edge, especially since some of my private practice colleagues still billed using ledger cards and made their appointments in the same kind of schedule book used by my hair stylist. Through my continued interest in technology and a willingness to serve as a guinea pig on multiple occasions, I worked my way up in the world of “big” hospital IT. Having spent a good chunk of the last decade convincing physicians to add technology to their practices, I never thought I’d find myself feeling such a backlash against technology. According to USA Today this week, “46% of physicians report burnout: cynicism, less enthusiasm, low sense of accomplishment, too much bureaucracy.” Physicians feel overworked and are unable to cope with the stressors they currently face. They report being less empathetic toward their patients. Many cite EHR use as a key part of the problem, but I think there’s a lot more to it than that. I’m wondering whether we as a society are becoming increasingly burned out and think that technology is a significant part of the problem. Instead of freeing us, smart phones are increasingly tethering us to the workplace. One of my friends recently reported working nearly 10 hours during her week-long vacation, citing the need to “protect” her boss from covering while she was out. I was certainly guilty of checking email on vacation when I was an employee, but I always felt supported in taking time off and knew I could forward critical emails to the person covering me so that she could address them. In turn I covered others while they were away. Eventually I learned to not even open Outlook. Through social media, we’re under constant pressure to document every moment of our lives and share it so the world can see how interesting our lives are. There are plenty of studies citing Facebook and other social media services as actually making people feel like their lives are less meaningful or less satisfying than others because of what they see posted. Luckily most of the people I follow on my personal Facebook account are pretty mature – there are rarely photos of what they’re eating (unless there’s a great story attached) and don’t post their every move throughout the day. Although they post some spectacular vacation photos, when I see them I’m more likely to tease them about the risk of having their houses burglarized since they just advertised they were away than I am to be jealous. I didn’t think too much about how technology is changing us as a society until I had the recent pleasure of taking my nephew on a trip to the East Coast. We visited several historical cities and quite a few monuments and landmarks. I was surprised to see that the atmosphere was very different than when I was in the same places just a few years ago. Rather than taking photos of the sights, everyone seemed to either be trying to take a selfie with the monument in the background or to take pictures of each other at the monument, blocking others from even seeing it in some cases. My brother is a photographer and once made a comment about his children’s generation being the most photographed but least seen. With the advent of digital technology, people don’t have to ration their shots any more. I tried to explain to my nephew about film coming in cartridges of 10 or rolls of 24 to 26 pictures back in the day. You had to choose your subjects carefully and you certainly didn’t take a picture of every single thing you found interesting. Although you might entertain your family and friends by showing them 35mm slides projected on a bed sheet (carousel if you were fancy, stacker if you weren’t) you definitely didn’t take hundreds of photos at a museum and make a nuisance of yourself. At one location, there were so many people taking pictures with tablets (including full-size iPads) you could hardly see the exhibit because of the air clutter. I hadn’t intended on seeing the world through someone else’s screen held aloft. It turned into a teachable moment. My nephew and I had a good discussion about the psychology of all this and how technology makes people feel. We also talked about how it can physically affect people as well. He mentioned hearing that Disney had banned selfie sticks, and after this week, I think it’s a fantastic idea since I was almost hit a couple of times. I’ll be interested to see 10 or 20 or 30 years from now how immediate access to information has impacted our ability to leverage human memory. Personally I think we’re losing the ability to make good memories – rather than being in the moment and experiencing something, we’re either multitasking on our phones, listening to music, or trying to take a picture of ourselves doing it. What’s worse is seeing people allow their children to be cheated by the lure of technology. At one famous site, I watched a family of four sit next to each other, completely absorbed in their devices. The pre-teen daughters were playing games, the dad was checking sports scores, and mom was just surfing. None of them were talking about the history of the property or why it was significant to our country’s history. Technology could have been a tool for them to talk about the site or the Civil War (which I also heard referred to as the War of Northern Aggression, which was slightly amusing in 2015) but instead it was a distraction. They certainly weren’t giving it the reverence it deserved as a burial site. As technology professionals and leaders in our field, I think that some re-examination of how technology impacts our lives may be warranted. We may not be able to change the technology demands of our organizations, but we can certainly advocate for wise use in our workplaces. Let’s start with rational email policies. My favorite boss had a three-day policy – if you needed a response within three business days, you weren’t allowed to send an email but had to actually talk to another human being. It was one of the most cohesive teams I’ve ever experienced. We also need to support our employees and colleagues in taking real vacations that don’t involve the expectation of checking email or voice mail. If something doesn’t change, we’re going to need a bunch of new ICD codes to address it. What do you think about the pervasiveness of technology in today’s society? 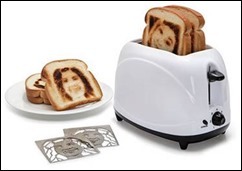 Did you know that you can turn your toast into a selfie? Email me. Amen, sister! Your observations take me back to the time I took my daughter to one of her first birthday parties. Her friend, turning 7, got an iPhone for his birthday. I nearly choked on my cake when he opened the gift. Being connected is often necessary for a number of reasons. It’s what we do with that connectivity, and how much control we allow it to have over our lives, that sometimes gets us into trouble.